Next up, check out this darling quilt. Seriously, is it not the sweetest? The pattern is called Betsy's Closet by Brenda Riddle. 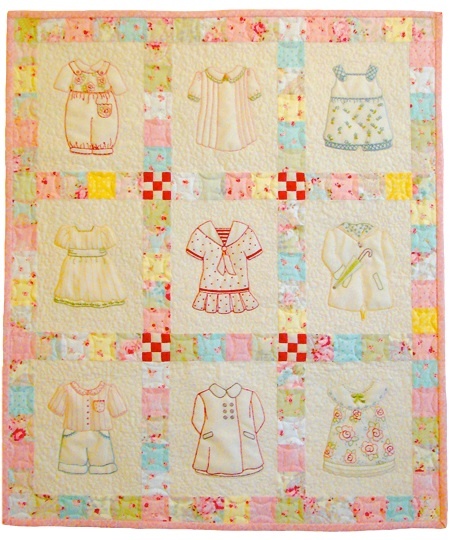 Jenny and Kathy are hosting a stitch along to make this darling stitchery quilt and anyone can join in on the fun! All the information for the stitch a long can be found here or here. Also, Brenda has some kits made up that you can buy with all that you will need and because I want mine to look just like the picture, I bought one. I cannot wait for it to get here so I can start! Beautiful stitchery and beautiful verse on it! I love anything Brenda Riddle and love her fabric lines! I love your stitchery, and I think the Betsy's Closet quilt is adorable too! Oh we are going to have fun! Wonderful stitchery, Amy. Cute, cute quilt too, are your going to start working on this, soon? What a darling pattern!! Looking forward to seeing your progress!! Oh, this is tempting. I'm following the Stitch Along. I need to think about this for a day or two. I'd love to join in, but am not sure I have the time to commit. So, so, tempting. I'll let you know if i join in! beautiful stitching Amy! love the pearl i use it too instends of dots sometimes! great pattern this closet! nice day to you!